The pictures looks awesome. My mouth is watering to taste the corn flour halwa. I will definitely try it out and let u know. BTW; I tried out your tomatoe soup and it came out very well. Thanks. Hi Myth,great color.Corn flour and microwavable,how cool is that? !Thanks for the recipe. 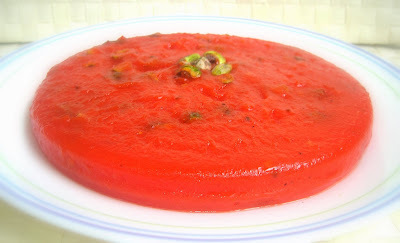 Colourful looking halwa with less ghee... Thanks for sharing. 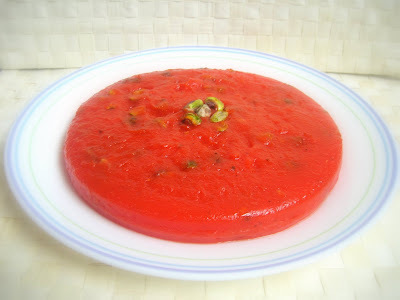 Excellent Halwa,,,,looks colourful and interesting too..Actually we was kid, my auny prepared same type with maida,i enjoyed it alot..
Sowmiya: Thanks a lot and thanks a ton for the feedback. Pls try this too and let me know. It hardly takes 10 mins to do. Thats all. Menu Today: Yes, thats a plus point. Less Ghee. Usha: Let me try the same with Maida and let me post that too. Thanks for the info. Great looking desert, will like to try it. Did u use besan or cornflour ? bcoz in one of the pics I see a cup of sugar & another cup like besan, but isnt cornflour white ?? confused..
Aruna: I used only Corn Flour and not Besan Flour. 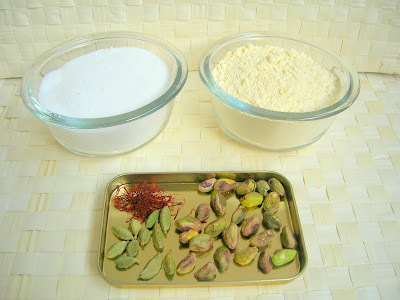 Though Corn Flour Resembles Besan Flour very much like color etc., it differs very much in taste. The Corn Flour that I bought in the Indian Store is Yellowish like the Besan flour. Its very easy to get confused unless we taste the flour each time we use or label the jar. Thanks for dropping by. It's a definite try...but ghee looks more...can i replace or reduce myth? Anisha: Yes really can reduce the amount of ghee. 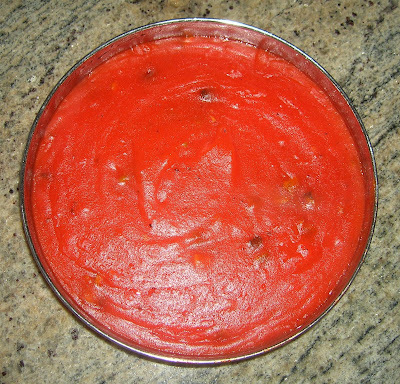 The corn flour is the main reason for the shine in the halwa, more than the ghee. HI This looks really beautiful like a jelly. I am sure it tastes good too. 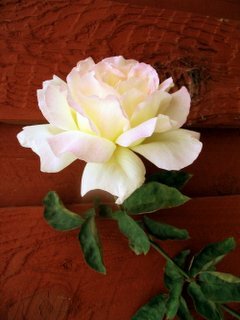 I especially love its colour. This is the first dish of yours that i have tried..very quick,easy dish and tasted yummy and looks good...thank you for sharing.Will definitely try many more dishes that are posted. I tried sauteing just the corn flour(no ghee/oil) on medium flame for a 2-3 mins before adding water,sugar and microwaving,this helped quicker removal of the raw smell. Sandhya, that was a wonderful idea. Thank you so much. I will do your way next time I make it. Thanks for trying my recipe. It's only 2 cups. After you add two cups, the water may be added to get the consistency. If it is too thick and still the content has a raw smell of corn flour, water is added little by little and cooked. There are a variety of brands for corn flour and each flour needs a different proportion of water. So I have written 4 in the ingredients and 2 in the recipe. Thank you. I've been searching for the recipes and I think I finally found it. Looks so delicious and Yummy. One question? Have you used Corn starch or corn flour? I once tried with corn starch but it came out very flimsy, it did not have the consistency. I tried this but using oil instead of ghee and leaving out the red food coloring (as I don't eat any animal products) and it was delicious. I'm going to have a look around for more of your recipes.